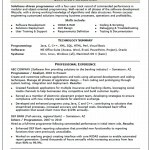 Download free computer programmer resume templates for all types of levels including entry, mid-level, and highly skilled professionals. The entry-level should be written for those who have just completed or an internship with the desire to seek a position in the private sector. 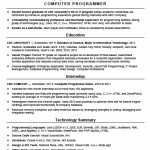 The mid-level, or ‘skilled’ resume, is for individuals who have between three (3) to five (5) years of hands on experience with a company or organization. The professional is for a person with at least five (5) or more years and is seeking a role with a company or organization that is a team leader or a senior programming role. The available formats are in Adobe PDF (.pdf), Rich Text Format (.rtf), and Microsoft Word (.doc) that are editable and show a sample template of how your credentials should be written. The objective for a computer programmer should be to state exactly the type of coding or software creation they would like to perform at their new company. The employer will look at the this as the premier position they would like to have and if the exact position is available the candidate has a bigger chance of getting the opening with the business or organization. When stating the objective it is important to ensure that it is short (2-3 sentences) and to the point. 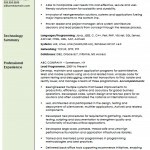 It is often the introduction to the resume before writing your skills, previous job experience, and education.